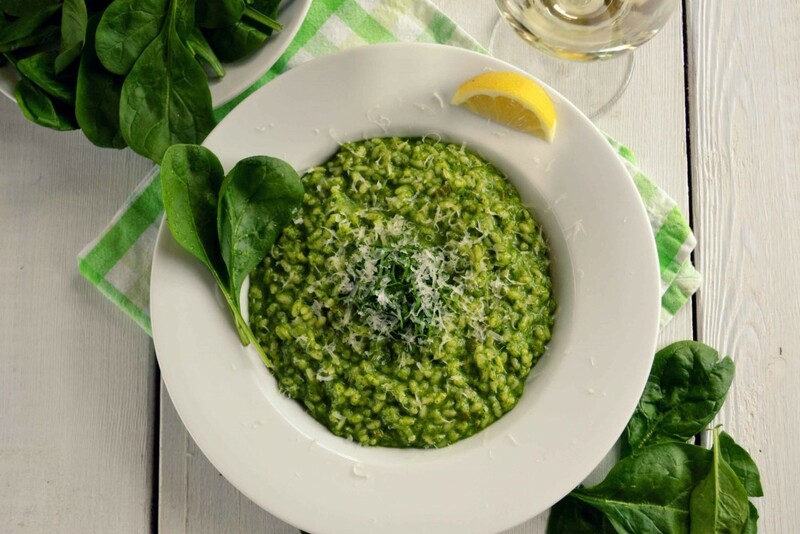 Simple and delicious, this main course or side dish risotto gets its vivid colour from a quick pesto made with fresh spinach leaves and toasted pine nuts. Indulge in this classic Italian comfort food with strings of melted Parmesan cheese in every forkful. 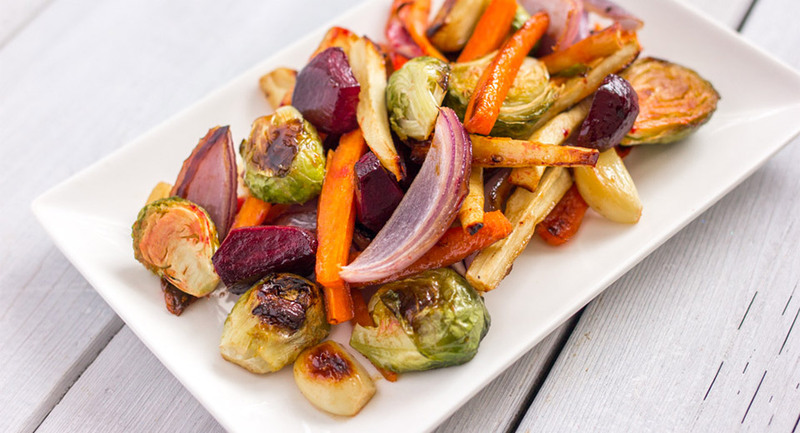 Enjoy it as a vegetarian weeknight dinner or serve as a side dish with grilled chicken or prawns. Spinach is the star in this rustic risotto for two. 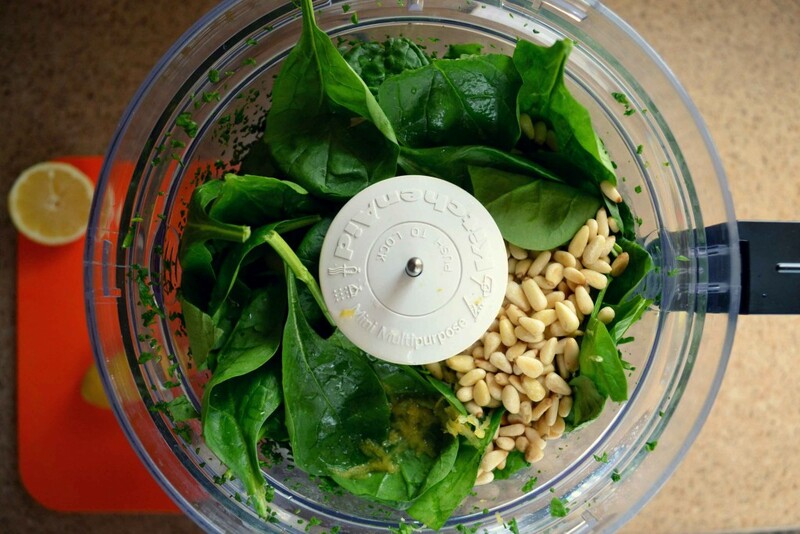 To make the pesto, add half the spinach to a food processor and pulse a few times to finely chop. Add the remaining spinach, parsley, pine nuts, garlic, lemon zest and juice. Set the food processor to high speed. Drizzle the olive oil into the working processor while the pesto comes to a puree. Set the pesto aside. To make the risotto, pour the chicken stock into a medium saucepan and set over medium heat to come to a simmer. Meantime, pour the olive oil into a large sauté pan and set over medium heat. Add the onion and celery to the oil and cook 5 to 6 minutes until softened. Stir the rice into the vegetables, allowing it to toast for a minute or two. Pour in the wine. Cook, stirring constantly, until the wine is absorbed by the rice. 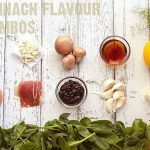 Begin adding the hot chicken stock, about 1/2 cup (125 mL) at a time, stirring constantly until the liquid is absorbed between additions. Continue adding the stock and stirring constantly in this manner for 20 to 22 minutes until the rice is cooked but still has a bite to it. Remove from the heat. 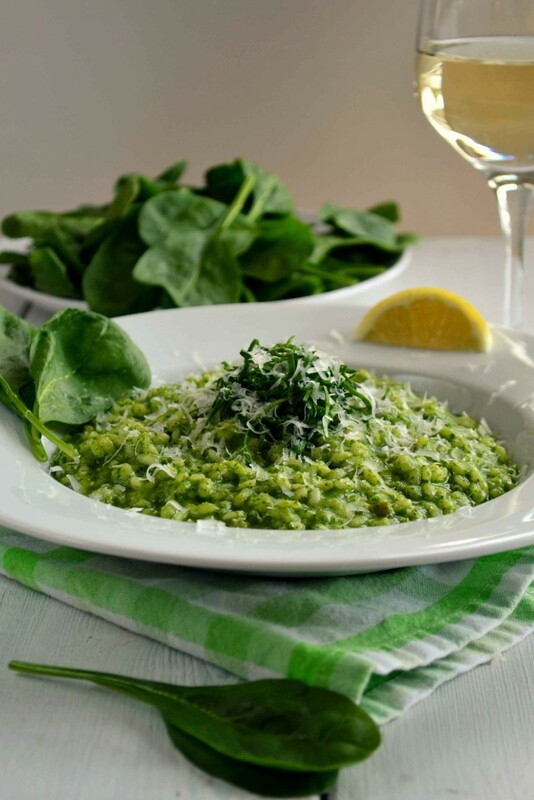 Stir the pesto, Parmesan, butter, salt and pepper into the risotto. Cover and set aside for a few minutes. Serve topped with a little more grated Parmesan and spinach sliced into thin ribbons (optional). Tip: To toast raw pine nuts, add them to a dry skillet over medium heat and cook, tossing gently, 4 to 5 minutes until lightly browned. 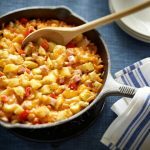 This recipe was developed by Amy Bronee, the writer and photographer behind the award-winning home cooking blog FamilyFeedbag.com. 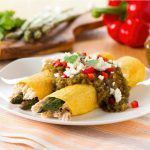 Since 2011, millions of home cooks around the world have visited her blog for easy-to-follow recipes, mouth-watering images and stories about everyday life in the kitchen. Through her hands-on cooking classes, Amy loves to connect with other home cooks, share ideas and have fun in the kitchen making delicious food together. Her first cookbook, The Canning Kitchen: 101 Simple Small Batch Recipes (Penguin Canada, June 2015) celebrates the tradition of preserving in the modern home kitchen. 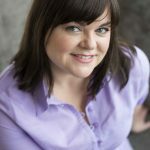 When she’s not wearing an apron, Amy enjoys running, reading and snuggling with her husband and two young sons in their cozy island home in Victoria, BC.